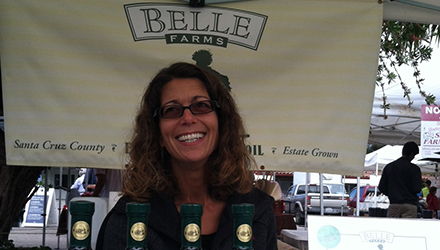 Belle Farms began in 1997, when Steve and Marguerite Remde decided to plant a vineyard on their property in Wastsonville. They decided that grapes and olives make the perfect pair, and what started as a small family vineyard soon progressed into the seven acres of olives, and six and a half acres of grapes. Producing outstanding extra virgin olive oil and wine grapes quickly became their passion. Today, Steve and Marguerite also offer consultation services to vineyards and orchards. Steve and Marguerite’s three children also play a big part in the ongoings of the farm, helping pick olives during harvest and assisting Marguerite at farmers markets. Together, the Remdes have made Belle Farms into a collaborative enterprise grounded in a love for family, agriculture, and the local land.